Former prime minister Tony Blair has called for faith to be given a central role in tackling the world's problems. Mr Blair said faith should be rescued from extremism and be a force for progress, in his first speech on faith since becoming a Catholic. He said politicians found it difficult to talk about faith because they "may be considered weird". His speech was accompanied by a noisy Stop the War protest and silent vigil by Catholic peace group Pax Christi. Mr Blair, who converted to Catholicism months after stepping down as prime minister last summer and is now a Middle East envoy, told an audience of 1,600 at Westminster Cathedral he was often asked if faith was important to his politics. "If you are someone 'of faith' it is the focal point of belief in your life. There is no conceivable way that it wouldn't affect your politics," he said. But he said he had "no claims to moral superiority" and, referring to his former press secretary Alastair Campbell's famous remark while he was PM that "we don't do God", Mr Blair said it was "always a packet of trouble to talk about it". He said for politicians to admit to having faith "leads to a whole series of suppositions". These ranged from being "considered weird" to people assuming "that your religion makes you act, as a leader, at the promptings of an inscrutable deity" or that politicians desire to impose their faith on others. Mr Blair said religion was not in decline and acts of terrorism had highlighted the fact that "we ignore the power of religion at our peril". "Religious faith is a good thing in itself that so far from being a reactionary force - it is a major part to play in shaping values which guide the modern world and can and should be a force for progress," he said. "But it has to be rescued on the one hand from the extremist and exclusionist tendency within religion today." He said religious faith was most obviously associated with extremism in the name of Islam, but there were extremists in "virtually every religion" and those who used "their faith as a means of excluding the other person who does not share it". He said his Faith Foundation, to be launched later this year, would bring together different faiths to promote religion as a force for good. In a question and answer session later, Mr Blair was asked if he would have done anything differently in the light of the fact that he recently converted to Catholicism. He said: "There is nothing I look back on now and say that as a result of my religious journey I would have done things very differently but that is expressly not to say that I got everything right." Outside the cathedral a crowd of protesters blew whistles and made noise, saying they wanted to hold Mr Blair to account over his role in the Iraq war. Organisers of the demonstration said they were not attacking Mr Blair's freedom of speech, but his right to be treated as a pillar of respectability. The Catholic peace group Pax Christi also held a silent vigil before the noisy protest. Among them was former Iraq hostage Norman Kember, who said: "What happened to me was a minor blip in my life compared to the continuing plight of Iraq and the way ordinary Iraqi citizens have suffered so much. 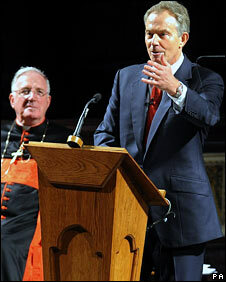 "I feel it is partly Mr Blair's fault and I don't like the idea of him talking in a church. I feel what he did was un-Christian." Terry Sanderson, of the National Secular Society, said: "Mr Blair's call for religion to play a bigger role in world affairs is like trying to douse a fire by showering it with petrol."